Good Girl Bad Girl Slot is neat 3D video slot by Betsoft. What makes it special is the volatility control feature which allows you to play the slot in good mode, the bad mode or both. This is one of the loosest slot machines with 97.8% RTP. Check out our Free Slot Machines section for free Betsoft slots. The Pitchfork and Halo are the special wild symbols. The pitchfork can appear on reels 3,4 and 5; the Halo on reels 1-2-3. Whenever they appear on the reels, they will turn into a wild and reveal a hidden multiplier. The bad mode multiplier can go up to x4, while the good multiplier can go only up to x2. This one is not easy. You will need to land the Pitchfork and Halo side by side to trigger the bonus. The bonus has 2 variations according to the mode you play. In both versions you will have 4 boxes to choose from. The boxes contain small win, medium win, big win and collect which ends the bonus. While playing the good mode, the small and medium win boxed are glowing, while in bad mode it’s the other way around. To trigger this bonus you need to get 3 money wheel symbols anywhere on the reels. Then you will need to spin the money wheel for an opportunity to win cash, free spins or the progressive jackpot. This feature is almost similar in both modes, except the progressive jackpot which is different in each mode. 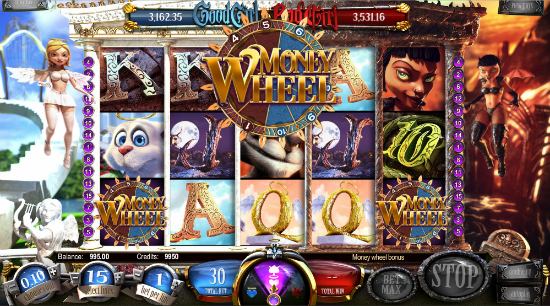 If the money wheel triggered while playing both modes simultaneously, you will need to choose if you wish to play a bad money wheel or the good one. Progressive jackpots can be won only while betting max. Standard BetSoft double up feature. After every winning combination you can click the double up and bet on the next coin toss. Good Girl Bad Girl slot is a special game. The risk control feature has a lot of potential , but unfortunately it was used only partially. The good mode indeed pays more often, but after playing all 3 modes, the differences are not as visible as we would like them to be. 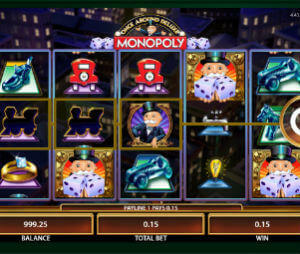 Nevertheless, this is a fun a slot to play with top notch graphics. On top of that, Good Girl Bad Girl is one of the loosest online slots with 97.8% payout.